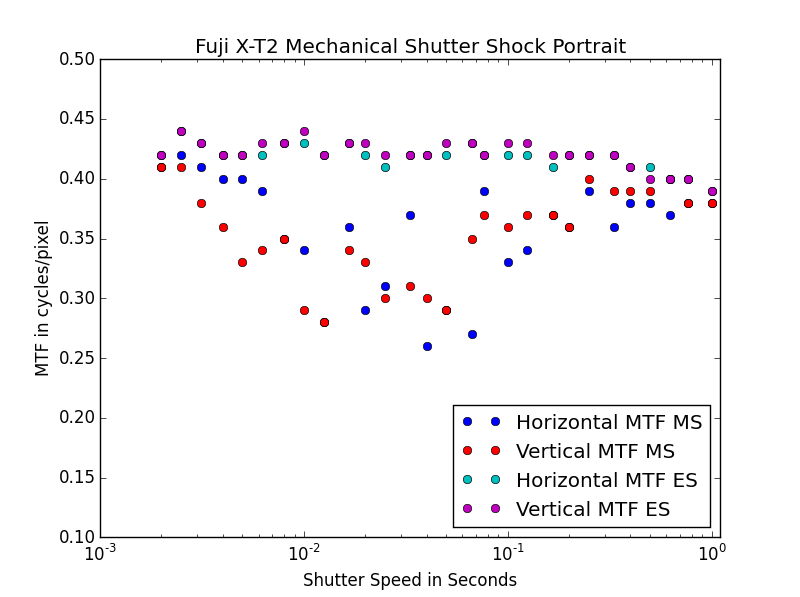 Shutter shock is an issue that has plagued early models of mirrorless cameras. Unlike in a DSLRs, the shutter must wind to cover the sensor very quickly, then release. This additional movement causes mirrorless cameras to be more susceptible to the shutter action. DSLR cameras are not immune, and have their own host of problems in the form of mirror slap, but it was in mirrorless that this issue came to the forefront. 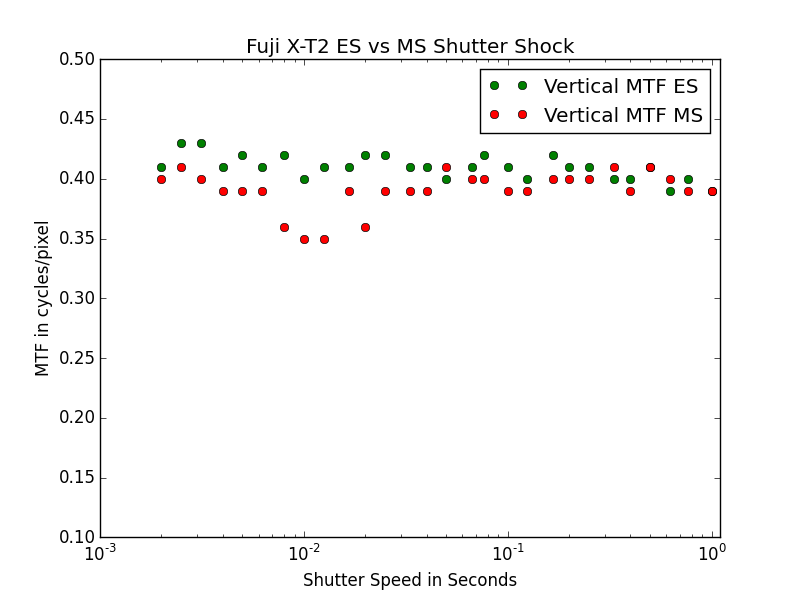 This site’s interest in shutter shock should be clear. To what extent can a tripod minimize the effects of shutter shock? In order to test this I am going to use a modified version of the MTF testing I described previously. Previously I used a backlit razor blade as an edge to test sharpness. The razor blade is an excellent high contrast, high resolution target, but the images are time consuming to post process through MTFmapper’s single ROI function. Now, I am going to use one of the tilted square targets that MTFmapper automatically identifies. This has two advantages. First, I don’t have to crop the images before feeding them into MTFmapper. 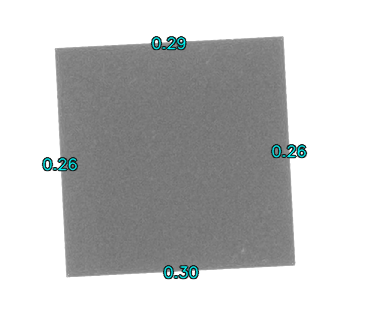 Second, the tilted square gives me measurements of both the horizontal and vertical movement of the camera. The test target is shown below. The camera has a Singh-Ray 77mm Variable ND filter attached to the lens. In this particular case, I am using a Fuji X-T2 with a Rokinon 85mm 1.8 manual focus lens. This isn’t the ideal camera for testing shutter shock, but it is the one I have on hand to begin with. I am using a RRS TFC-14 tripod with the BH-30 head. This is middle of the range in terms of stiffness. The procedure for testing the shutter shock is as follows. Focus the lens to the target wide open, then stop down to f/4. Maximum light on the target. ISO 400, Raw. Set the desired shutter speed on the camera. Adjust the variable ND filter to the point that correct exposure is achieved. I started at 1/500s and worked down to 1s in 1/3 stop increments. Import images to Lightroom and export to tiff with default settings. Open images in MTFmapper to analyze edge acuity. The mechanical shutter is consistently slightly worse than the electronic shutter, and particularly so right around 1/100s. To complete this test, I repeated it with the camera in portrait mode. 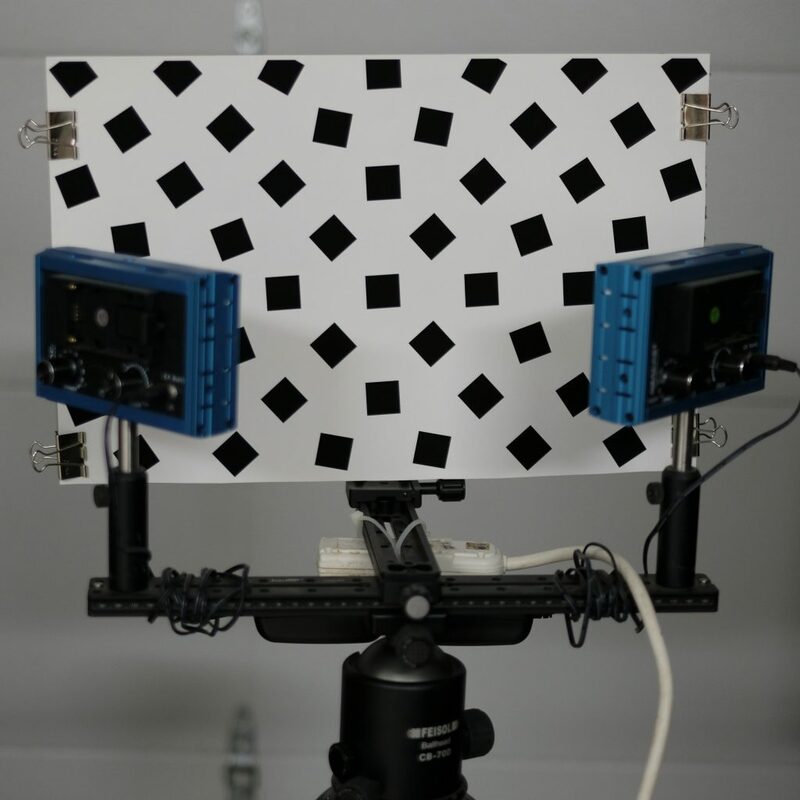 The system should be more susceptible to shutter shock in this configuration, as the shutter motion is no longer pushing straight up and down on the tripod apex. 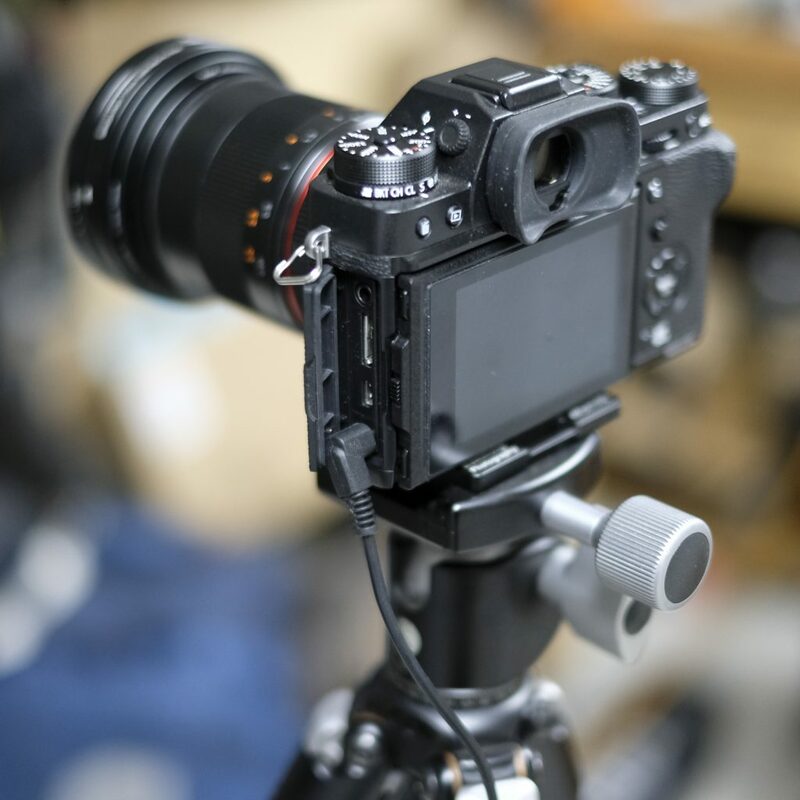 In portrait mode, the motion of the shutter will cause a torque about the tripod apex in a motion corresponding to the pitch stiffness of the tripod. I have set up portrait mode by rotating the ball head into the side pocket, as shown below. Alternatively, I could use an L bracket to set up portrait orientation. I will try that in a later post. The results are below. This time, I have just plotted both the MS and ES results on the same graph, as there is enough separation to be readable. The effect is hardly visible to the naked eye. Importantly though, this proves that this method is quite sensitive. 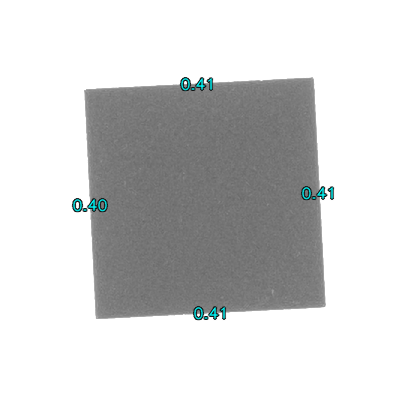 We should be able to measure very small deteriorations in image quality. How much does using a stiffer, or flimsier tripod affect the shutter shock? How much worse is the shutter shock when using a telephoto lens mounted on the tripod with a lens foot? Does using an L bracket help or hurt when the camera is in portrait mode? Does the shutter damping mechanism in the Fuji X-H1 help? Does the IBIS of the Fuji X-H1 help or hurt? 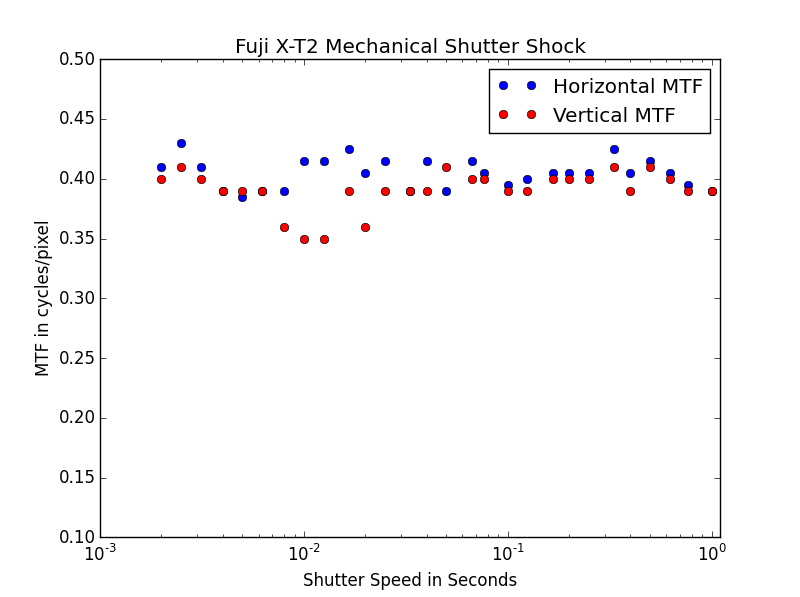 Shutter Shock is a high frequency motion. Does adding mass help more than tripod stiffness? How much does changing the focal length affect the shutter shock? Please post any additional ideas in the comments! I have a macro rail sitting on the desk for that purpose :). range of 1 second to 10 seconds. times; does it level off at some point? I only tested up to 1s. It does fall off slightly, and I think that it is a result of the variable ND filter going outside of its normal operating range. As I approach 1s the images tilt heavily magenta and this can start to throw off the MTF measurement. Its a small effect, though good eye. add-on battery grip affect this? Good question. I have a battery grip for the X-H1. I suspect it would make things worse when mounted directly to the tripod, but better when a lens foot is being used.